Mercedes which introduced the concept of a luxury hatchback with the B-Class in 2012, has now brought in a facelift. Which should essentially mean new headlamps, alloy wheel design and a few adornments inside the cabin. But does the new Merc model offer more than just that? We find out. 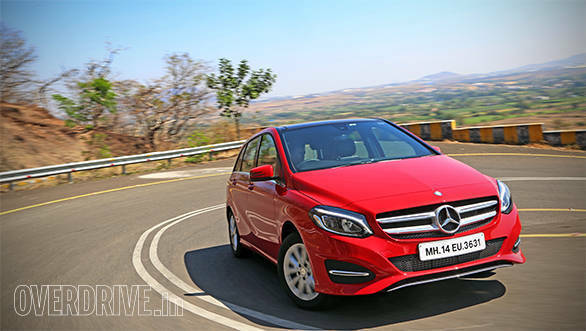 The B-Class is instantly recognisable as a Mercedes. Its face is similar to what you see in the new C-Class. There are projectors with LED rings around them, lending a premium note to the B. Move over on to the side and you can see the B-Class facelift is a tad longer than the older one. This is because the new car really is 34mm longer than the outgoing version. 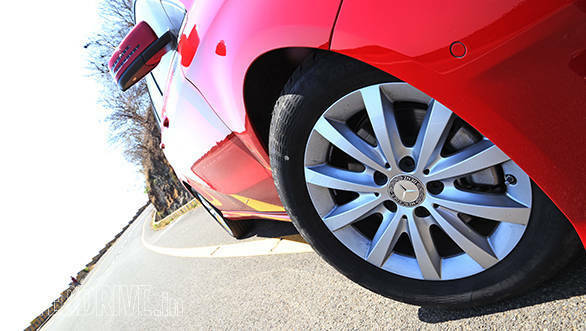 We would have preferred to have Mercedes give it sportier alloys than the ones you see here, especially they look a bit disappointing on this bright red sample we drove. Move over to the rear and you'll find that the bumper is new and has a chrome strip which hides the tail pipe. Again, there is the C-Class influence here starting with the steering wheel with larger buttons and moving up to even the COMAND screen. When we drove the car in Spain a couple of months ago, we liked the hi-res touchscreen system. In the Indian version though, the screen size has increased compared to the earlier car but is still smaller than the one available internationally. Mercedes have also added satellite navigation, a welcome addition for a car that is called a luxury tourer. Other features include powered seats with memory function and electrically adjustable lumbar support for the driver and co-driver, panoramic sunroof. The upholstery is all-black (depends on the exterior colour and there is an option for beige as well) interspersed with a bit of chrome on the dashboard. 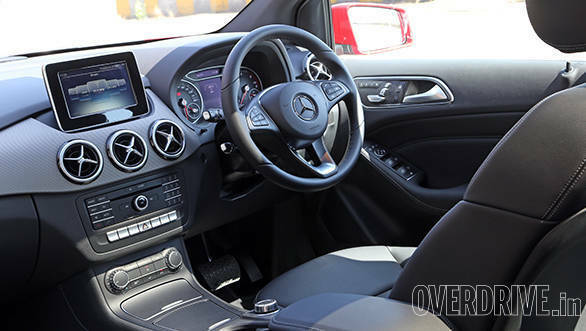 That aside, there are the usual safety trappings that accompany any Mercedes-Benz car - seven airbags, ESP, adaptive braking, brake assist and many more. There is also lots of space even for six-foot plus passengers such as me. I was comfortable in both the driver's as well as the rear seat as far as leg room was concerned. 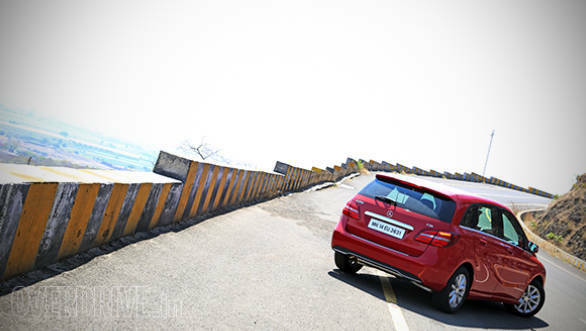 However, the B-Class' more upright seats fall short in terms of lower back comfort over long distances. Also, there are no rear AC vents in the model we drove (200 CDI Sport) and we would have also preferred more usable storage spaces. Speaking of storage space, the B-Class gets a massive 488 litres of boot volume. While facelifts are generally restricted to cosmetic bits, the new B-Class has ditched the old 109PS engine for the sprightly 135PS version. This 2.1-litre diesel engine also does duty under the hood of the CLA and GLA and produces 300Nm of torque. A seven-speed DCT with paddle shifters as standard transmit all the power to the front wheels. The transmission seems a little hesitant at parking speeds, however, once on the move, it is fairly responsive. Our car did the 0-100kmph run in 9.6s which is a second quicker off the older B. Trundling around in town, the B 200 CDI returned 14.5kmpl while cruising at a steady speed of 100kmph on the highway, she gave us a fuel economy of 22.1kmpl, a significant bump up than before. The additional power helps in the cruising department, something which the B was always known for. Speeds north of 100kmph are held effortlessly and the engine feels a lot more punchy. The refinement is also top class and there is very little noise percolating inside the cabin post three digit speeds. Mercedes also claims that the car can hit a top speed of 210kmph, something which we couldn't verify. 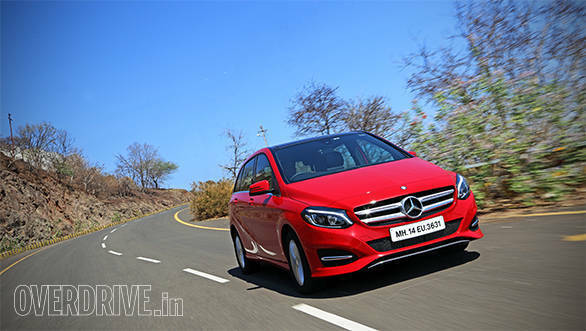 The new B-Class is set to be in Mercedes' showrooms from March 11. There is more equipment on offer now, it looks better and has a refined powerful and frugal engine. Aside from a couple of things like more storage spaces and addition of cool looking alloys, the B-Class has everything that a thinking luxury car buyer wants from a car. But this was always the case with B-Class buyers and the facelift only manages to offer them more value for their money than before.